Harness the power of positive thinking and learn to manage time more effectively to supercharge sales for your small business. There are hundreds of eponymous laws, which are formalized versions of observations made by and named after a person. From science to business, there’s a law for anything you can think of, and in this case, there are three important ones for your sales team to pay attention to. Use these laws to create habits among your team that lead to success all year long—mitigating the potential for failure, harnessing the power of positive thinking, and managing time more effectively. Focusing on positive or negative thoughts brings positive or negative experiences into your life. The Law of Attraction was discussed in depth in the book and movie The Secret because it can be a powerful tool for everyone, including your sales team. The idea is that where your attention goes is where energy flows. If your sales team is feeling down and defeated by a bad month, they’re likely talking about it with co-workers, stressing about it on their drive home, and focusing on “not doing bad” in the upcoming month. Think of all the energy being directed toward not being successful—whether your team realizes it or not, they’re willing themselves to have another bad month. The key to harnessing the Law of Attraction is to let go of that unconstructive thinking and reframe the concern, or negative thought. Instead of focusing on last month’s low numbers, think and talk about the upcoming successes of this month. If your team has a mission statement, make this an integral part of that and weave it into every team meeting. This positivity will benefit your team, and the entire company, even if you don’t believe in the power of energy. Focusing on the positive, and leaving out the negative, makes your team upbeat and keeps morale high. An important piece of Law of Attraction is visualization. If you want to dig into that with your team, follow the steps for effective visualization, shared by the National Association of Sales Professionals. Use this technique one morning a week with your team. Work expands so as to fill the time available for its completion. How often are you interrupted every day? At least four or five times—and if you’re a manager or team leader, that number is likely in the double digits. Thanks to Parkinson’s Law that means you’re doing the same amount of work in less time—or at least trying to. What does that lead to? “When people are constantly interrupted, they start working faster to compensate for the time lost. Not necessarily better, but faster. Deadlines are most of the time up to someone else, so people have to get creative and finish the task in whatever time they have,” explained Irinia Nica, of Hubgets. If your sales team is constantly rushing to get work done, they’re not doing their best work. When this becomes obvious to clients and prospects is when sales take a nosedive. This keeps people from having unimportant conversations when your team is trying to work. The reminder about emailing also gives their co-workers a gentle nudge to get in touch without interrupting them. Anything that can go wrong, will go wrong. Preparation is the name of the game in sales—preparing before a call, preparing the perfect deck, preparing for the worst. Knowing that anything that can go wrong will eventually go wrong is important for your sales team. When your team lives and breathes by this law, always prepared for the worst and you’ll be successful no matter what. Make a list of all the possible things that could go wrong each quarter. Then figure out how to mitigate those issues, so if something comes up, you’re ready. Some potential issues may carry over quarter after quarter, like “Our lead sales associates leave,” and those are all the more important to have a solution for—if it’s a worry all year long, it’s worth the extra work and prep time. Create your back-up plans as a team so everyone feels empowered to be successful and prepared. Use these eponymous laws as guidelines for being successful year-round. Encourage your sales team to buy into them and harness their lessons to land more sales. Make them a part of your team culture, and you may just find success comes easier than ever before. Jessica Thiefels has been writing for more than 10 years and is currently a full-time blogger. She is also an ACE Certified Personal Trainer, NASM Certified Fitness Nutrition specialist, and the owner of her own personal training business, Honest Body Fitness. She’s using her experience from writing, editing and marketing to help people get healthy and learn to love what their bodies can do. Follow her on Twitter, Facebook and Instagram for health articles, new workouts and more. Your website is often customers’ first impression of your small business. Here’s how to make sure it’s a good one. Your company’s website is like your digital calling card—it could be the first interaction a new customer has with your small business. That’s why it’s worth keeping your website up to date and ensuring it makes the best first impression on prospects. Even if you get some help with your website, here are some important do’s and don’ts for small business owners. Follow these guidelines to put your best foot forward and step up your digital marketing game. Make sure to list your address, phone number and operating hours right on the homepage of your website. The easier it is for customers to call and visit your business, the better. Don’t bury that information on another page of the site. Attractive photos of your products entice online shoppers, while photos of you and your team add personality and authenticity to your website. You might be able to take these yourself, but only if they look neat and professional. It could be worth the investment to hire a professional. You should assume customers are looking at your website on a smartphone screen. (According to the Pew Research Center, 77% of Americans own a smartphone.) Some websites are designed to be easy to navigate on mobile devices, but older websites typically are not. A mobile friendly website not only improves the customer experience, it can also help you rank higher in Google search results. Your website should answer common questions customers have about your business: where you’re located, what products or services you offer, pricing information, some background on the company and more. But it shouldn’t take too many clicks or too much scrolling to get around your site. Skip the novel about how your business got its start, and focus on what customers need to know. If a customer lands on your website, what do you want them to do next? Visit your store? Call your business? Sign up for an email newsletter? These are all good ways to maintain a relationship and encourage customers to make a purchase. But they won’t take the bait if you don’t spell it out! Don’t forget to include your call to action on your website. In early 2017, SolarWinds® MSP investigated the cybersecurity preparedness, experiences, and failings of 400 SMEs and enterprises, split equally across the US and the UK. Now that the results are in, my anxiety level regarding the state of Internet security has never been higher. I’m also a bit disappointed we (as in the industry) have not made more progress, when it comes to securing our customers. At one moment, our networks are secure because we are patching diligently and then the next day stuff is exploding all around us. Is there really anything we can do? The answer is yes; there is a lot we can do. The news of the WannaCry ransomware attacks targeting companies around the world this last weekend is just the latest in a long line of cyber carnage that has been happening. If the past few months are any indicator the damage inflicted on businesses by cyberattacks will escalate, and as this weekend proves it can all happen very, very quickly. It would appear the bad guys have broken through the front lines and are pushing the cyber defenders to the limit. The new SolarWinds MSP survey provides us with insight and perspective around why and how this is happening. Microsoft patches 45 unique vulnerabilities in its nine products, including three previously undisclosed vulnerabilities under active attack. These patches include one for a Microsoft Word zero-day exploit. This exploit has proved equally popular with cyber criminals dropping ransomware, banking Trojans and targeting Ukrainian rebels with malware. Apparently, the hard part of this story is that this zero-day exploit has been around since security firms identified attacks as far back as November 2016, with most firms pointing to the Dridex banking Trojan as the major payload. WikiLeaks and Shadowbroker zero-day exploits. Between the “Vault 7” disclosures from Wikileaks and the Shadowbokers zero-day exploits for everything from Windows XP to Windows Server 2012, cybercriminals have (for free) a whole new arsenal of government-made malware to throw at us. If things were not particularly good for Defenders in Q1, Defenders in Q2 are going to have to step up their game even further. So, the question is how do you tackle the problem of zero-day exploits? Well it’s a combination of your existing best practices—which you are already doing, right?—and securing what’s being targeted. Many of the exploits dumped by Shadowbrokers assume access to Server Message Block (SMB) and the ability to make an SMB connection over TCIP. The recommended best practices are to disable SMBv1 and make sure you are blocking outbound and inbound UDP ports 137 and 138, as well as TCP port 139 and 445 at the firewall. Since one of the exploits targets Kerberos, we know Kerberos clients need to send UDP and TCP packets on port 88, so blocking that at the firewall would give you a win. Since security researchers have managed to get their hands on the payloads, you can expect antivirus vendors to be issuing updates pronto. The new SolarWinds MSP survey provides some much needed perspective and insight into why we’re in this predicament. There are some really startling revelations within the survey, and my view is that it shows the business arena is ripe with opportunities for Managed Service Providers (MSPs) and IT providers to deliver more security services—even simple things like Patch Management as a Service (PMaaS), user awareness training, and Backup as a Service (BaaS). Statistically the belief that “it will never happen to us” simply doesn’t add up. The survey offers more insights and data around the kind of security technologies being used, and reveals an updated cost for data breaches. Given the revelations of the past few months, it’s an important read. The bad guys have more tools to break into networks now, which means MSPs and IT providers are going to have a lot of victim customers demanding security services. There are, simply put, three generally accepted methods of authenticating identity: knowledge; possession; and inherence. The first is familiar to everyone in the form of the password, passphrase, PIN, or even the pattern drawn with a finger on some smartphone lock screens; this is also sadly the weakest form of authentication. The knowledge factor relies on something you know, and that's at once its biggest positive and negative. On the plus side, a user can create (if the login process allows, and all enterprise strength ones should) a truly 'strong' password. I have placed strong within inverted commas for a reason; one person's strength is another's weakness. So, while the user may well think that transposing an “a” for an “@”, and throwing a couple of exclamation marks at their partner's name is strong, a hacker could crack it in less time than it took me to write this sentence. Earlier I mentioned three methods of authentication of knowledge, possession, and inherence. Knowledge: It’s not always enough and does not always equate to intelligence. Certainly in the cybersecurity world a little of it can have big consequences. Another layer of protection is needed, and that's where Two-Factor Authentication (2FA) comes in. By adding another layer of authentication, which can either be through possession (something you own) or inherence (something you are), accessing your accounts and services suddenly becomes exponentially more difficult for the bad guys. Not impossible, but by applying a secondary authentication factor, the task becomes so much harder that it will protect most accounts from most would-be attackers. Possession: Think of 2FA in terms of protecting your vehicle if you like. A steering wheel lock deters the casual thief, but can be broken fairly quickly by a seasoned criminal. Yet if the car also has an engine immobiliser the theft will take longer, be much harder, and require different hardware. Traditionally, the second factor in a 2FA equation has involved possession. The thing that you “own” being a token. This can be in the form of a hardware token or increasingly a one-time authorization code (OTAC), also known as a one-time password (OTP). Whatever you call it, this code can be generated by dedicated hardware (not dissimilar to the hardware token already mentioned) or more likely, the user's smartphone. Once the user has passed the username/password login phase of the authentication process, they are asked to input a code. These 'soft tokens' are generated either by an authenticator app on the device or sent via a text message on demand. Whichever method is employed—and text messaging is slightly less secure because of the potential for interception—the output is the same: a cryptographically secure one-time passcode that is time limited to 30 or 60 seconds depending on the settings at the server end. Because most staff not only already have the hardware to generate the codes, but also carry it around with them everywhere, implementation costs and staff training are both kept to a minimum. So how does this one-time code generation work again? Well, the OTAC itself is a hash-based code that uses a combination of a secret key (the user initially enrolls with the code server) and the current time to generate a code using a cryptographic hash function. The code expires to the pre-determined countdown timer, and if the right code is entered in the right timeframe, then you are authenticated. Inherence: But why not use the inherence factor instead? After all, something that you are is far more secure than your smartphone or a bit of plastic hanging from your key fob, right? The truth is that the jury is out on that one. Biometrics—that's what we are talking about here—can be a very secure method of authentication in most scenarios. Fingerprint scanners can be fooled, but it involves a lot of determined James Bond-style preparation with things like the target’s prints being lifted and transferred onto latex. Similarly, facial recognition software and even iris scanners have been fooled with photos in the past. However, the real problem with biometrics is cost, both in terms of initial rollout and ongoing support through the enrollment and usage phases. This could all change as fingerprint scanners for smartphone access becomes the de-facto specification. I already have my authenticator app locked down with a fingerprint scan required to access it. This means I've kind of hit the multi-factor authentication sweet spot: all three factors in use at once. In the age of Google, it’s not at all surprising to realize that our greatest confidant and holder of our deepest secrets is a simple search bar with a flickering cursor. Free of others’ judgments, we can ask it any question we like, at any time during the day, and get an answer in a fraction of a second. From queries like “What is the meaning of life?” to “What is twerking?” the things we search for on Google speak volumes about the cultural zeitgeist of our times. While this collective consciousness was once the subject of hours of study by philosophers and novelists, today all you need is an Internet connection and a little tool called Google Trends to check our nation’s cultural pulse. Many thought leaders and psychologists have questioned whether we’re living through an epidemic of narcissism, spurred by social media, attention-seeking celebrities and self-absorbed millennials. Since we’re all evidently so self-aware, it makes sense that we would go to Google to ask whether we fit the description of a narcissist or not. In the Food & Drink category, turmeric, the main spice in curry, has exploded in popularity over the last few years. According to Google’s Food Trends report, the exponential growth is a result of Americans’ growing desire to learn about the effects and benefits of functional foods and how best to use them in their recipes. For example, when Americans search for YouTube videos on turmeric, they’re searching for how to use the ingredient to combat everything from arthritis and joint pain to high cholesterol and skin disorders. The indispensable fluid “water” consistently appears year after year at the top of the most searched list of the Food & Drink category. Besides an epidemic of narcissism, we also seem to be living through a so-called wisdom epidemic in which inspiration is becoming increasingly commoditized. Just take a look at your Instagram or Facebook feeds to find all kinds of generic motivational quotes with overused boat and ocean metaphors. In line with this trend, the search for “motivational quotes” and “inspirational quotes” has steadily increased in the past decade. In the category of Family & Relationships, we also found that the search for the term “pick up lines” is increasing with every passing year, reaching its peak during February, presumably near Valentine’s Day. Both of these search trends just go to show that as time goes on, Americans are increasingly likely to confide Google with their deepest insecurities and burning questions. One particularly revealing trend is the rise in the number of searches for “how to have a miscarriage” or “how to self abort.” According to New York Times columnist Seth Stephens-Davidowitz, this is most likely due to the closing of abortion clinics in states where it is becoming increasingly difficult to get an abortion. If you look at the following time-lapse map, you’ll see that the volume of searches for these terms is greatest in states where there are major abortion restrictions, such as Texas and Tennessee. Google Trends also reveals that issues such as discrimination and identity relations are increasingly on people’s minds. If you look at the search volumes for terms like “bigotry,” “white privilege,” “racism definition,” “xenophobia,” “ageist” and “misogyny,” you’ll see a sustained increase in the last six to seven years. Thanks to Susan Cain’s widely popular book Quiet, the need to understand introverts and how to tap into their hidden talents has soared in the past four years. Just look at the volume of searches for “introvert” or “extraversion and introversion” and you’ll see a steady increase since 2007. In accordance with the growing support for legalizing the recreational use of marijuana (58% support it today versus 12% in 1969), the search volume for terms like “weed,” “cannabis” and “kush” has increased exponentially in the last decade. Perhaps as a result of the rise in stay-at-home mothers and telecommuting options, the number of searches for terms related to “jobs from home,” “flexible jobs,” “work from home” and “stay at home moms” has increased in a sustained manner over the past 12 years. At the same time, searches for “daycare” and “babysitter” has increased at a relatively slow pace over the last 12 years. 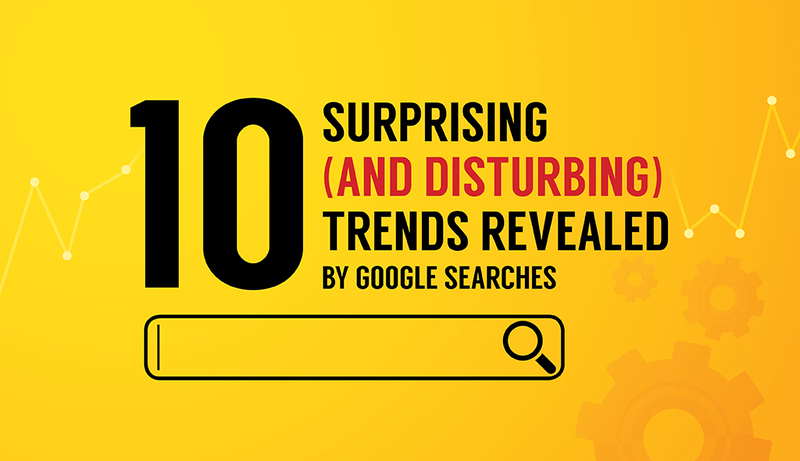 Did you find any of these trends particularly surprising or revealing? Do you know of any search trends you don’t see here? If so, we’d love to hear from you. Just drop us a line in the comments section below, and we’ll get back to you. So you’re minding your own business one day, talking to a buddy about going to the movies. “Ah, let’s take a cab,” he says. “Do you have Taxidrivr?” Next thing you know, he’s telling you all the marginal advantages it has over Lyft and Uber, how you can choose the preferred odor, talkativeness, and hair style of your driver. You’ve never even heard of it, but then he starts telling you about TixR4Kidz, which lets you buy movie tickets and popcorn before you walk in the theater and even guarantees you a seat not behind Andre the Giant. This app is maybe three weeks old but now your grandmother is using it. Staying hip today is a full-time job. Every month there’s a new app that you gotta have. Some of them fade away, some of them become part of life, some of them are something to browse while avoiding talking to your friends and family. The good news is you’re reading an article by an entitled millennial who has vague-at-best memories of a time when smartphones weren’t more common than wristwatches. Maybe some of these are going to be parodied on edgy Netflix original series, maybe they’ll just be something to toy with while pooping. 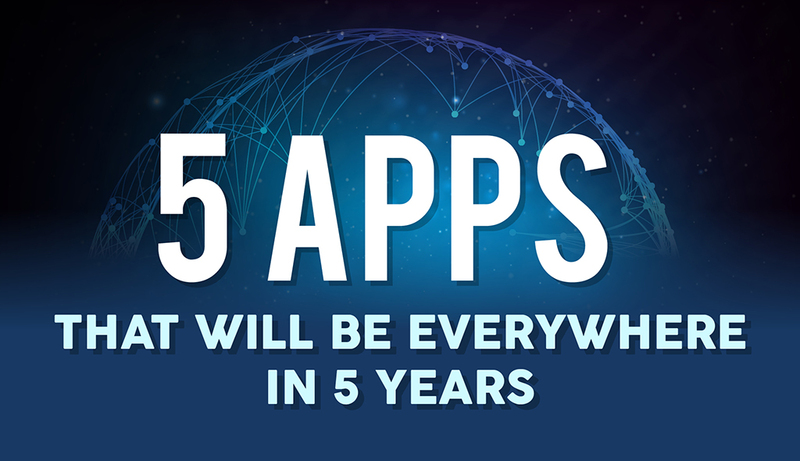 Either way, here are five fast-growing apps that are going to be everywhere in a few years. Have you ever wondered why all Facebook stickers are so… Japanese? Browsing the sticker list is a bit like attending an anime convention, but with less body pillows. The reason for this is simple: Facebook is jacking the style of Line. Originating in Japan in 2011, Line seemed like just a typical messenger app: you send your friend messages, they ignore them. Line’s hook? A cast of adorable characters arrayed in a variety of poses and situations instead of emojis. It doesn’t sound like much until you remember exactly how much people love cute Japanese mascots: Pikachu, Hello Kitty, Vegeta. 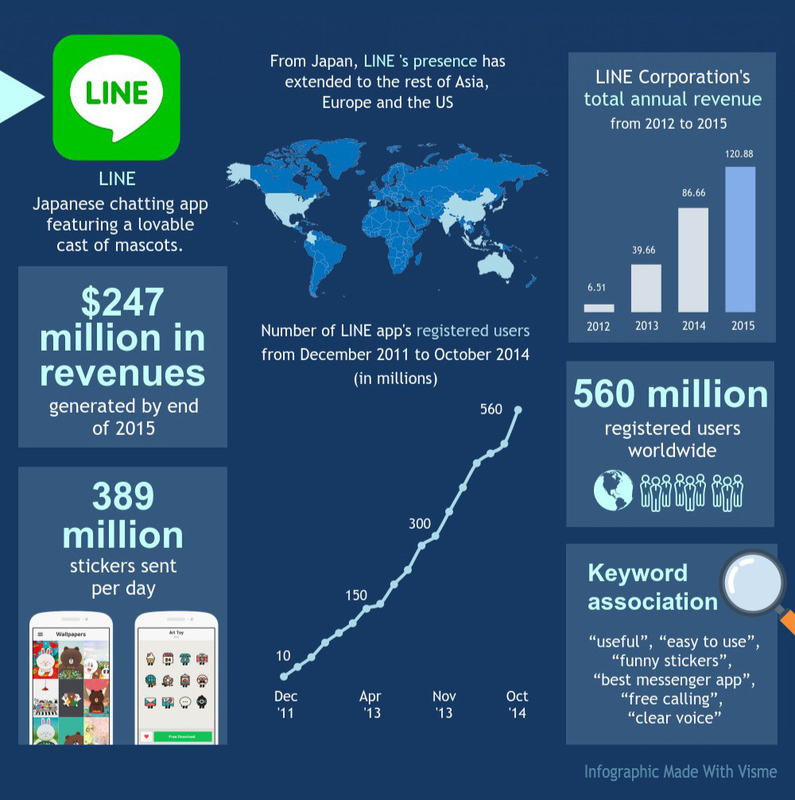 How successful is Line? They went from 6.5 billion yen in revenue in 2012 (about 64 million USD) to 120.9 billion (1 billion 185 million USD) in 2015! When a company grows to almost twenty times its original size in three years, that’s your cue to start paying attention. Line is free, but makes a killing on sticker sets and games available through the app. Line is so big in Japan that there are Line Stores you can go to, where you can buy bunny rabbit stickers and duck plushies. Before you think that the buck will stop there, Line has also spread to Taiwan, South Korea, and China and has become hugely popular there too. With over 200 million monthly users and growing, there’s a great chance that Line will be filling the void that Facebook’s impending uncoolness will create. It’s not all rising sunshine and rainbows, though. Line went public this year, but their stock is expected to be undervalued by experts, mainly because they took two extra years to do so. Line’s potential in the West is hard to say. Whether they’re the next Yu-Gi-Oh or the next Fighting Food-Ons is still to be determined. You either have or know someone with a sleazy Craigslist story. 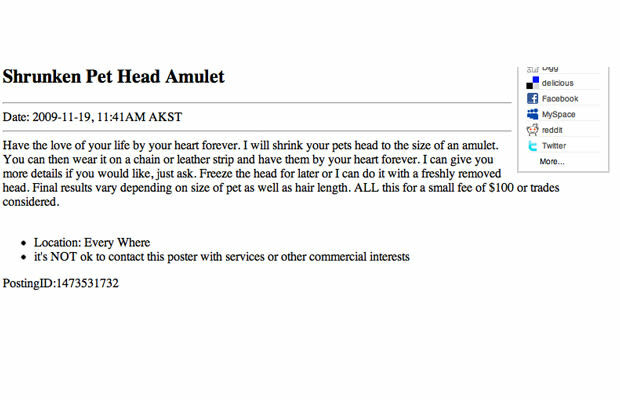 It’s a great place to buy things, but to do that you have to wade through people looking for partners to join them in filling a hot tub with marinara or offers to shrink your dead pet’s head and put it on a pendant. So you want to buy and sell stuff, but you don’t have time for Ebay auctions and too much shame for Craigslist. 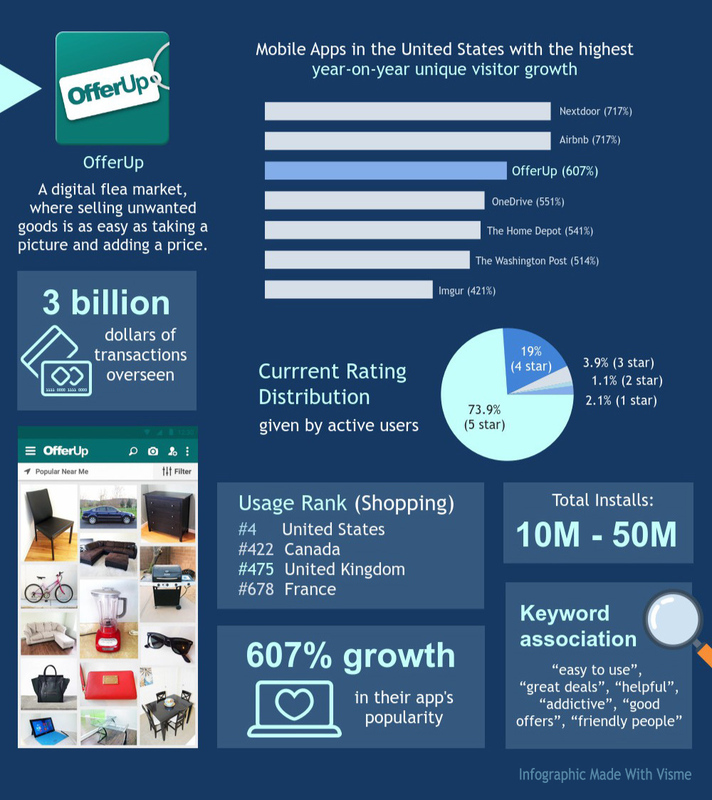 This unusually large niche is where OfferUp is shining. The premise is incredibly simple: you take a picture of your Simpsons lunchbox or hand-carved salt shakers and attach a price. People in your area can see the good and strike up a chat with you. If you find a buyer, they come to an arranged location and make the purchase. Buyer and seller then rate each other, to make it easier for others to find trustworthy and cordial merchants. Craigslist has little mobile presence, and that’s where OfferUp is shining. The app is totally free, so it doesn’t collect any revenue— but don’t expect that to last as their profile grows. Although OfferUp bill themselves as a safer, slicker alternative to Old Man Craig and his List, it has had its share of run-ins. Turns out there’s no absolutely safe way to invite strangers into your home, judging from the multiple robberies and assaults that have come from OfferUp deals. Robbing me is a pretty swift path to a four star rating, though. Maaaybe a three. I should warn you: if you’re over the age of 30, this entry might shock and confuse you. If there’s one thing that all young people love, besides Not Voting, it’s short and asinine videos of them and their friends doing stupid stuff. Vine, Instagram, Snapchat, all of them used for the sharing of inside jokes, funny faces, pets doing pet things. The next challenger to step in the ring is Musical.ly, which makes no bones about targeting teens. Their hook is that the app specializes in making music videos— and if you can’t sing, it’s great for lip-syncing too. Musical.ly is single-handedly reviving the dead trend of preteen girls mouthing along to Britney Spears or Ricky Martin that we were all so sure died in the mid-2000’s. 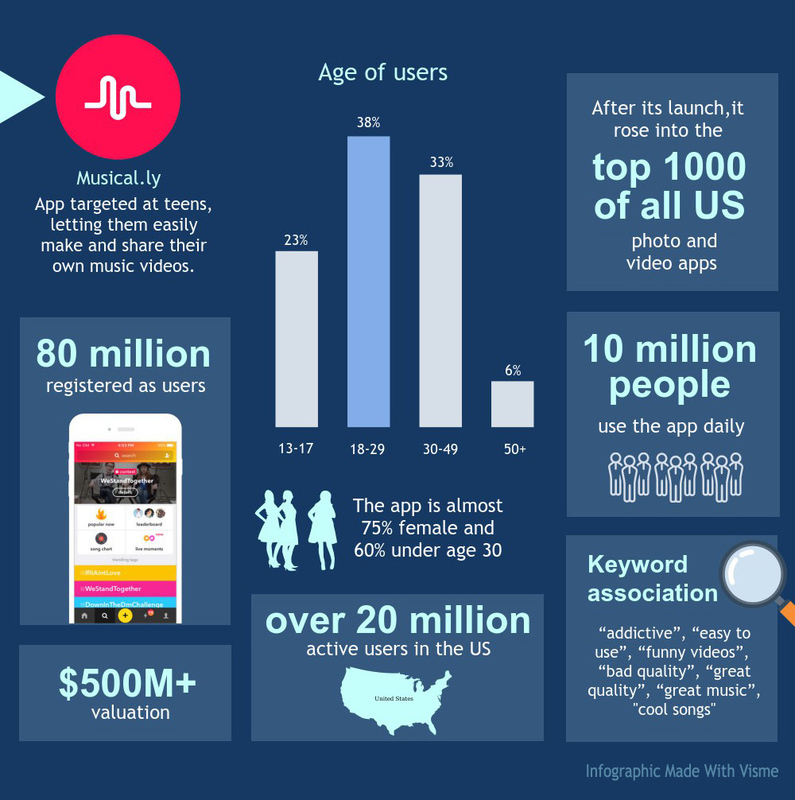 Only two years old, Musical.ly has gained sixty million users— almost all of them teenagers. If they can keep that pace up, everyone in the world will be using it by 2020. A May evaluation put them at 500 million dollars, with 100 million in venture capital. This sort of runaway success is usually only seen by horrible James Cameron movies, so how’s Musical.ly doing it? Simply, they know their audience. It’s active on twitter, tumblr, and Instagram. Videos made in Musical.ly are easy to upload and share among other sites, allowing it to seamlessly slide into the roster of teen app favorites. Popular users like Baby Ariel have landed spots on Good Morning America to explain the astonishing speed with which Musical.ly has joined the pantheon of hot-button lunchroom topics. Although it’s not clear if Musical.ly will have longevity to match its speedy growth, the team behind it have shown themselves to be savvy businessmen. Simply inserting their logo into each video in April 2015 caused their app to rise from 1250th most popular to consistently top 50 in just three months. Musical.ly should be careful, though: the very instant their consumers decide the app is uncool, it’ll be expunged from human memory. Nextdoor is there to change that: best described as a Facebook for a single community, it’s been instrumental in creating a sense of unity in communities across the US. This might sound like a nightmare— a Facebook where you’re only allowed to be friends with your racist neighbor and the lady who has turned her house into a cat shelter. But in practice, Nextdoor is like a neighborhood message board: power outages, crime alerts, recommendations for dog walkers and babysitters, and more. Nextdoor was founded in 2011, and it’s gathered a lot of shine since then. It was available in 700 neighborhoods at launch. By 2014, that number grew to 40,000, and now it’s over 100,000. It’s attracted talent like Dan Clancy (the engineer behind Google Books) and over a billion dollars in venture capital dollars. 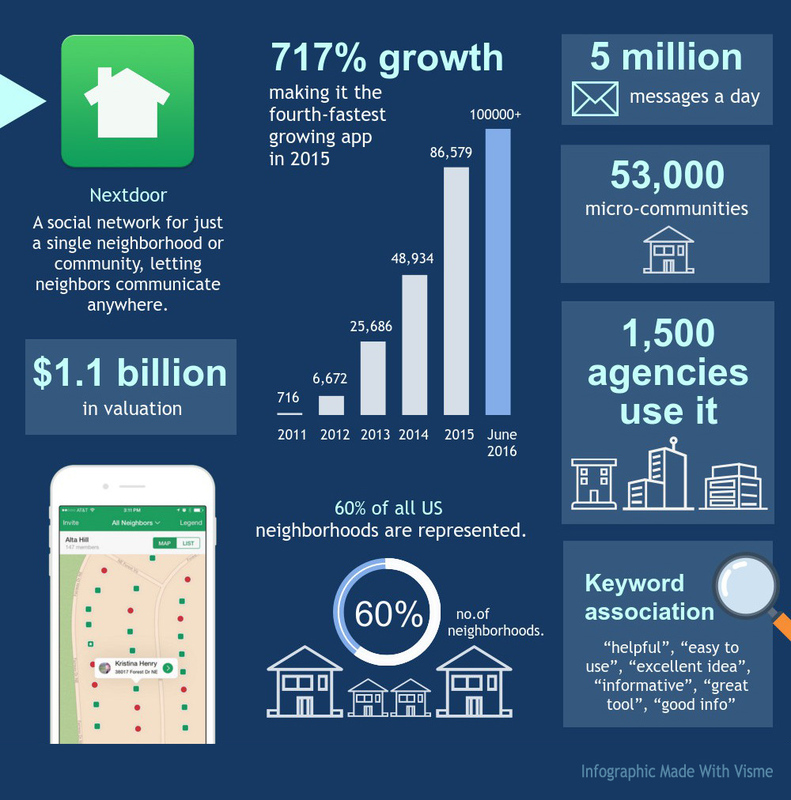 The last 18 months have been huge for them: the Nextdoor Android app enjoyed 717% growth in 2015, making it the fourth-fastest growing app that year. It won’t be long before you’ll have to explain to your elderly relatives (or will be the elderly relative who needs explaining) how to use Nextdoor. If it sounds like they’re putting money in my pocket, then ha! I wish. Nextdoor’s attracted its share of criticism: Fusion inadvertently made it look a lot more appealing by accusing them of (what else) racism in a March 2015 article. Racists are going to be racist one place or another, they don’t need an app for that. Whether Nextdoor encourages it or not, they’re on the rise with no sign of stopping. 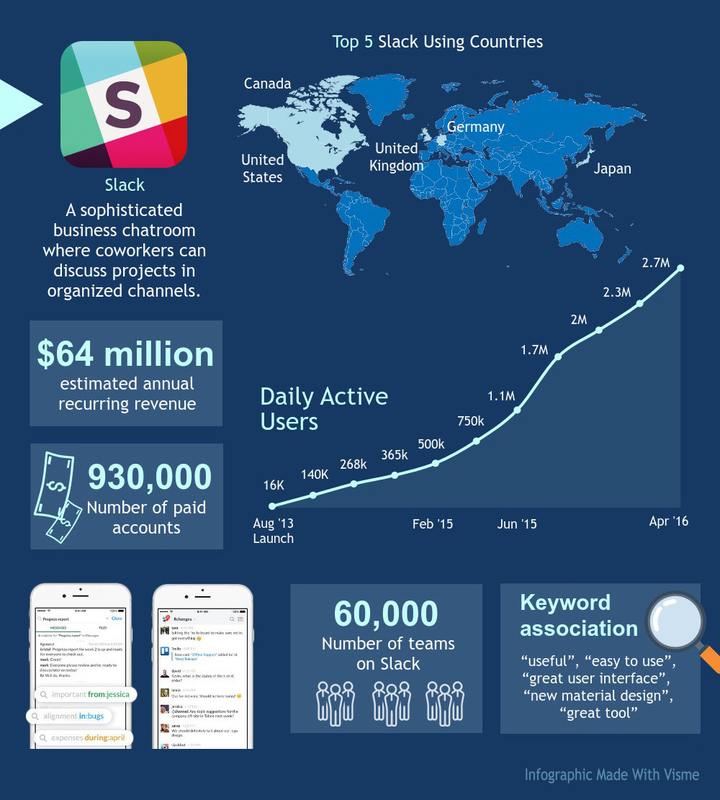 But what is Slack? It’s not that exciting: essentially a chatroom for businesses. It stores messages forever, organizes conversation into various channels, and effortlessly integrates with third party apps such as Trello, Abacus, Dropbox. Ease of use and slickness of interface has turned Slack from plucky newcomer to eight hundred pound gorilla overnight, as they boot competitors like Skype and Kik out of the ring for online business communication. Much faster and more efficient than email, Slack has also inspired imitators: Discord is focused on video games, while Google is working on the similar Allo app. It’s not that Slack is doing something new, it’s just doing it way better than anyone else before them. If you open their website, the first thing you see is “A messaging app for teams who put robots on Mars! !” I mean, who doesn’t love NASA, besides lawmakers? Slack’s rise feels suspiciously familiar, like soon we’ll all be using Slackmail and Slackdocs and telling each other to “Slack it later.” Forget five years, Slack is everywhere now. It’ll just be more everywhere in the future. Don't Let Hackers Use Your Vintage Passwords! While Vintage is great for the music industry, in IT, it's not the best plan. Lately, hackers have been using passwords stolen from social media accounts years ago to try and access other related social and business accounts. Recent password thefts from Myspace, LinkedIn, and Twitter informed/forced users to change their passwords on those accounts, but what about your other accounts that use the same password? If you were informed of a hack on your account in the past, and you used the same password elsewhere, it's probably a good idea to change that password sooner rather than later. The Best Hack Proof Strategy for your social media accounts is to use Two Factor Authentication (2FA). In its simplest form, 2FA sends a 4- or 6-digit code to your mobile device via SMS that must be entered in as a challenge on the login page after password credentials have been entered. EMV - Is Your Business Protected From Fraud? New EMV initiative results in stores taking on Fraud liability. Is your Store now liable for credit card fraud? Annual costs of card fraud in the US alone are estimated at $8.6 billion per year and is increasing. Fraud is expected to impact mobile payments as well. Prior to October 2015, for most counterfeit card fraud that occurred at retailers’ in-store locations, liability was with the card issuers. Since October 2015, that liability has shifted to the merchants, in certain cases, unless they have replaced or upgraded their card acceptance and processing systems to use chip-enabled devices and applications to process payment transactions. It’s estimated that 40 percent of the world’s cards and 70 percent of its terminals deployed outside the US are already using the EMV standard. Are you Protected? Find out if you are protected from fraudulent liability today! Call 888-953-9224 today for a free consultation. Windows 10 - Make Cortana Listen! Cortana’s finally made the leap to the PC in Windows 10, assuming control of the operating system’s search functions and dishing out just as much sass as the Windows Phone version. But by default, she doesn’t listen for your commands. If you’d like to be able to just bark commands at your PC, open Cortana by clicking the search field in the taskbar and select the Notebook icon in the left-side options pane. Select Settings from the list, then simply enable the “Let Cortana respond when you say ‘Hey Cortana’” option. You’ll need an active microphone for this to work, of course. While you’re poking around Cortana’s options, you can dive into the Notebook menu to fine-tune exactly what personal data Microsoft’s digital assistant can access. Remember, however, that like Google Now, Cortana’s effectiveness is directly related to how much she knows about you. Help your friends get the best solution for their IT problems and needs and earn a discount on your next invoice! Copyright © 2017 Techies 4 U, Inc. All Rights Reserved.